The Dam is the heart of Amsterdam. At the square are several attractions but the eyecatcher is the National Monument. It’s a pillar of 22 meters high and is the symbol for the liberation of the Netherlands in World War II as for the national unity. Every year the national ceremony Remembrance of the Dead is held at the monument on 4 May with the Queen, Minister-President and the Dutch television. To get an impression: here is a short video of 4 may 2016 (19 seconds). In daytime, the monument is a popular place with tourists to hang out a while. 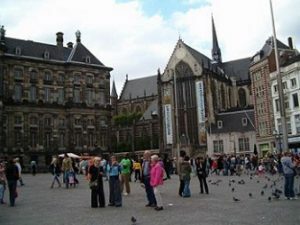 The city center of Amsterdam is the Dam quare with the Royal Palace and the New Church. The Royal Palace has a representative function, the King and Queen are not living here. It is possible to make a tour through the palace. The Royal Palace has e-tickets. Opening hours: 10.00-17.00. Admission is €10. Children under 18 are free. If there is a royal event, the palace is closed. 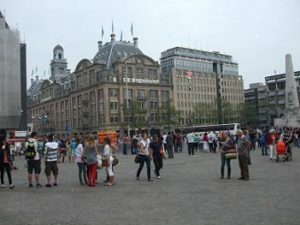 At Dam Square is the Madame Tussauds Museum. An online ticket is €20,50 for everyone of 16+. In the summer vacation of 2016 the online price was €15. If you book online, you don’t have to queue up but you can use the Fast Track VIP entrance. Children between 5 – 16 years pay €16. If you buy a ticket at the door the ticket is €3 more. A family ticket for two adults and two children cost € 66.50. Family tickets are only available at the door. It’s possible to buy combined tickets. For example an entrance for Madame Tussauds + canal cruise cost €33,75. The opening hours of Madame Tussauds are 10.00 – 17.30. In July and August the museum close at 20.30. 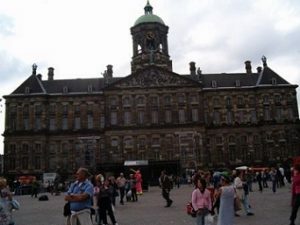 At Dam Square is the largest department store of Amsterdam: the Bijenkorf (Beehive). 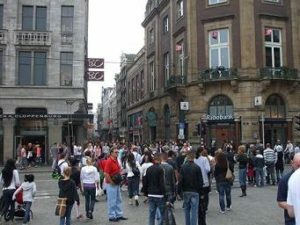 Two main shopping avenues – the Kalverstraat and the Nieuwendijk – start at the square. To Central Station is 10-15 minutes walking (1km). Three star Hotel Rho is situated on the corner of Dam Square. 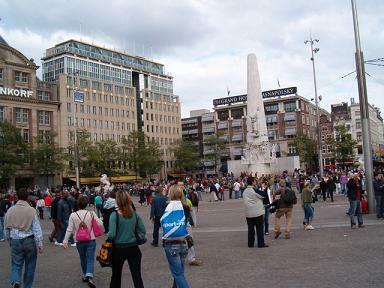 The property has a great location because Dam Square is the heart of the city. It’s 10-15 minutes walking to Central Station. Many attractions are nearby. Hotel Rho has more than 7690 reviews (8.0). Five star NH Grand Hotel Krasnapolsky is overlooking Dam Square. The luxury hotel has a monumental Winter garden where breakfast is served. Krasnapolsky has more than 5125 reviews (8.1). Just around the corner is 4-star hotel Swissôtel Amsterdam. Across the hotel is department store the Bijenkorf and the stop for the trams. Swissôtel has 2837 reviews (8.5).